“Oh I am Precious #7” Necklace - Eugene Pijanowski. 1986. Medium: Mizuhiki (rice paper cord), canvas. It took two detailed visits of The Met jewelry exhibit “The Body Transformed” to really appreciate and understand the message and the extend of the work. There is much to see, read, analyse and digest. Traditional exhibits wow us with the exceptional craftsmanship, luxurious pieces, sparkles and other visual elements that immediately and easily speak to our understanding of jewelry as objets of adornment and beautification - our peacock side if you will. But the team of curators that put together the exhibit over 5 years under the leadership of Melanie Holcomb, want you to go deeper and thing about how jewelry transforms the body from simple flesh to having extraordinary (sometime godly) powers. 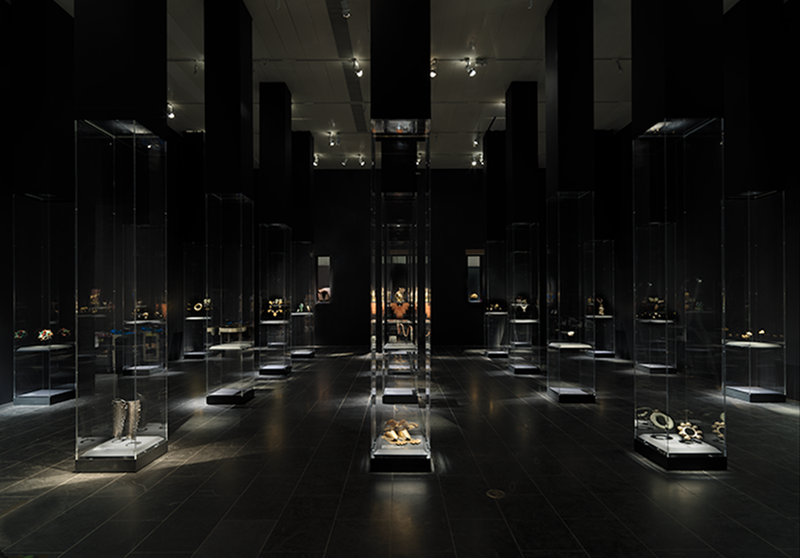 Starting in a dark gallery with lit glass columns showcasing a smorgasbord of pieces, we are invited to think about all the different parts of the body that have been bejewelled over the centuries: from golden toes to hair clips, nose rings to bracelets and belts. All displayed at the right body height - not always easy to view and a bit disorienting but you quickly get drawn in by the sheer beauty of the pieces. The next five galleries take you from ancient Egypt to tribal Africa, Hellenistic kings, Indian goddesses, Josephine Baker and Alexander McQueen, Mughal resplendence and finally contemporary artists. This dizzying diversity is made possible by the richness of The Met jewelry inventory that has been plucked from various departments and assembled for the exhibit (The Met does not have a dedicated jewelry department). Through jewelry, society communicates with the divine, establishes social status, exerts power, entices pleasure, documents cultural exchanges and political conquests, and rebels against the dominant power. The body as its canvas confers to jewelry a force and meaning unequal by other forms of art. It is the true bridge between the flesh and the mind, the connector of our outward appearance and inner emotions. Pair of Earflare Frontals, 5th-7th century, Shell. Wispering into the ear of the king. Exhibits of this magnitude do not happen without the financial support of art lovers and collectors. This is no exception: kazumi Arikawa, jewelry collector from Japan, donated 3 exceptional pieces to the museum and sponsored the exhibit: a dragon fly brooch by Boucheron, a bracelet by Lucien Falize and a parure in Shakudo from Hunt & Roskell. You can read more about him in Sandrine Merle’s article. (photos below courtesy of Sandrine Merle).